Australian Monitor AMIS26 2x6 Distribution Amp. The Australian Monitor Installation Series AMIS26 is a high quality 2 input, 6 output distribution amplifier. The AMIS26's 2 inputs can be balanced or unbalanced and each input's sensitivity can be switched between Mic and Line level. 24 VDC Phantom power is individually switchable per input and for ease of setup, a four segment LED level meter is provided per input. Each of the AMIS26's inputs is individually assignable to any of the 6 outputs via front panel DIP switches. Outputs can be balanced or unbalanced and feature up to 30dB of attenuation, so they can be run as any combination of line level or mic level outputs. 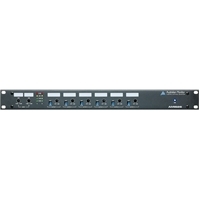 Ample label space is provided for both inputs and outputs and the AMIS26 is powered via a supplied 24VDC power supply. The AMIS26 provides a low noise, feature packed, signal routing solution to cover a wide range of installation needs at a contractor friendly price.